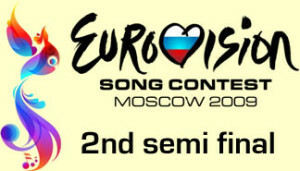 After Tuesday’s semifinal, this evening, we discovered who would fill the remaining places in the final on Saturday. Nineteen countries, including favourites Norway, competed for the ten available places. The hosts were Andrey Malakhov and Natalia Vodianova, who also hosted the first semifinal. After the fairytale theme on Tuesday, this evening it was all about Russian stereotypes. A Russian band, traditional Russian dancers and the obligatory Russian dolls were among the elements of the country on display. Then, it was time for the songs. Croatia – Igor Cukrov feat Andrea – Lijepa Tena – Clad all in black, Igor’s vocal was a bit quiet. Andrea was wearing an all white outfit. The song was strong enough to qualify, but it might suffer from its lack of impact. Ireland – Sinead Mulvey & Black Daisy – Et Cetera – Ireland’s first rock song. Sinead and co represented their country well, giving an energetic and solid performance. Latvia – Intars Busulis – Probka – Perhaps forgetting that Latvia is now an independent country, Intars sang in Russian. He moved around the stage as if he’d gone insane. This couldn’t possibly qualify for the final, could it? Serbia – Marko Kon & Milan Nikoli – Cipela – Strutting around in a yellow jacket, Marko, his mad hair and his backing group gave a performance worthy of a former winning country. The performance increased the songs appeal, turning it into a possible qualifier. Poland – Lidia Kopania – I Don’t Wanna Leave – Iceland qualified from Tuesday’s semifinal, so Lidia had reasons to be confident. Although the vocal was good, it was on the edge of going wrong at times. The two ballet dancers didn’t distract too much from the song. Norway – Alexander Rybak – Fairytale – The fans and bookies favourite was full of confidence. An entertaining routine was provided by his three male backing dancers, and Alex received a big ovation from the crowd. Cyprus – Christina Metaxa – Firefly – The bigger parts of the song proved too much for Christina’s week voice. The backing group did their bit, but it was unlikely to be enough. Slovakia – Kamala Mikulski & Nela Pociskov – Let Tmou – Returning to the contest after an 11 year sabbatical, Slovakia sent a ballad. The two voices were arranged well to give the song a firm impact. It hadn’t sounded like a qualifier until now. Denmark – Brinck – Believe Again – Having made changes for each of the dress rehearsals, Denmark finally settled for the presentation they wanted. Ronan Keating sound-a-like Brinck increased in confidence as the song progressed. Believe in 2008, Believe Again in 2009? Slovenia – Quartissimo – Love Symphony – The song with the fewest words since Nocturne in 1995, Love Symphony was possibly the classiest song of the evening. The four musicians burst through their light boxes and did a commendable ‘dance’ routine carrying their instruments around the stage. The brief vocal was sung strongly. Hungary – Adok Zoli – Dance With Me – Every Eurovision has to have a bit of stripping these days, and this year it was provided by the third choice song of the Hungarians. Zoli was a bit breathless by the end of this disco track, but Dance With Me had a better chance of qualifying than the previous two songs which were withdrawn. Azerbaijan – Aysel & Arash – Always – Fire dominated the video wall. AySel sounded a little wobbly at times, but not enough to make this a near certain qualifier. Greece – Sakis Rouvas – This Is Our Night – Talking of certain qualifiers, Sakis was as guaranteed to do so as it’s possible to be. Even an over elaborate staging was surely not going to stop Greece being in the top ten. Lithuania – Sasha Son – Love – From the overdone to the simple. Sasha started this ballad at the piano, but was soon walking around the large stage. Moldova – Nelly Ciobanu – Hora Din Moldova – Countries which sing about themselves never do well, and there was no reason to believe that Nelly’s lively offering was going to buck the trend. Albania – Kejsi Tola – Carry Me in Your Dreams – If Albania failed to qualify, Kejsi would be able to blame the person who thought it would be a good idea to have someone covered from head to toe in a green costume on stage with her. An example of a great song let down by the staging. Ukraine – Svetlana Loboda – Be My Valentine – Greece suddenly had competition for the prize for overdoing the presentation. Half naked gladiators and large ‘killer’ machines could easily have made people switch off as much as impress. Estonia – Urban Symphony – Randajad – A huge contrast to what had just been on stage, Estonia let the song do the talking, or perhaps the singing. String instruments and pure voices dominated this gentle, melodic song with classical overtones. The Netherlands – De Toppers – Shine – As previously reported by Eurovisionary, De Toppers have threatened to withdraw from the final. They were unlikely to be in a position to do so as this is the kind of song that the fans love, and everybody else makes a cup of tea while it’s on. The shiniest suits of the night, though. Our hosts opened the phone lines and then there was the traditional reprise. A short video was then shown of the singers in Moscow, followed by another reprise of the songs. After this, the phone lines were declared closed and the five countries who qualified automatically qualified for the final were shown. Then, it was time for the big moment, the results. The countries were drawn in no particular order. Their position in the running order would be decided later.